Written by Linda Whitehead in 2011, it encourages families to think of themselves as allies to their Disabled children by thinking about Disability in a positive way using the Social Model of Disability. The guide will help families ask the right questions of schools and to be more confident in seeking out a school that is inclusive of all children from the local community. 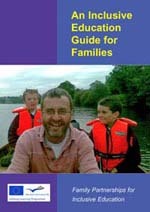 The guide is based on learning and evidence from visits to various countries and was funded by Grundtvig.